The Menu had the privilege to host three fine people on an offshore trip August 23. A coworker,Father and Son. Made our way offshore washing the jigs until we had a quad jig strike on small yellowfin. Lost one at the boat and landed three approx. 10#. Back on the troll and added a lone Dorado. 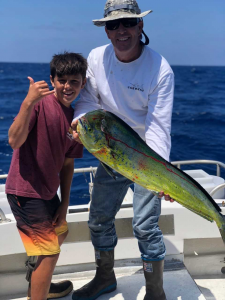 Ryan 14 landed his first dorado ever. Nice 11# model. “DOGHOUSE” Captures 1st. Marlin of the 2018 Season.